Kelvin Burt took the Peugeot XRV8 to a comfortable win on its debut in the first of two 25-minute V8 Supercars races on Saturday. Phil Bennett, in Nigel Mustill’s Opel V8Star, came from the back to win the second race. 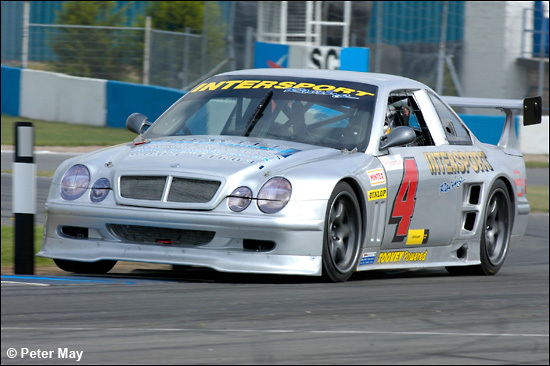 There was a healthier entry for this, the second round of the series, though Adam Sharpe, winner at Snetterton, in his Ford Falcon, was away racing in Australia. Nevertheless, there were plenty of new faces, and it was Phil Bennett, in Nigel Mustill’s Opel V8Star, who set pole at 1:10.670, just 0.058 clear of Kelvin Burt in Roger Etcel’s stunning Peugeot XRV8. 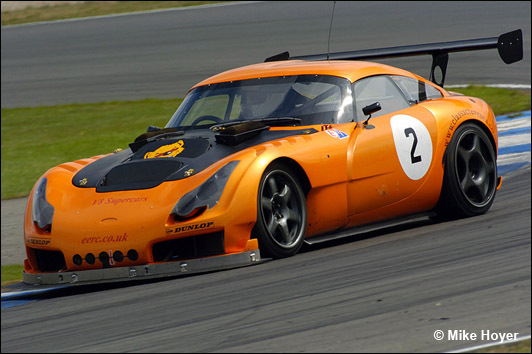 Steve Wood was third, in the WSR Jaguar V8Star, then British GT regular Kevin Riley, giving the Rollcentre Mosler a run on Dunlops. The TVR Tuscan Challenge cars, and their drivers, have found a home in V8 Supercars, and three of their number filled the next grid slots; Tim Hood has rebuilt his Tuscan into a Sagaris, which is currently a front-runner in the TVR Challenge, and he lined-up in front of old chums Darren Dowling and Andy Holden, in their Tuscans. 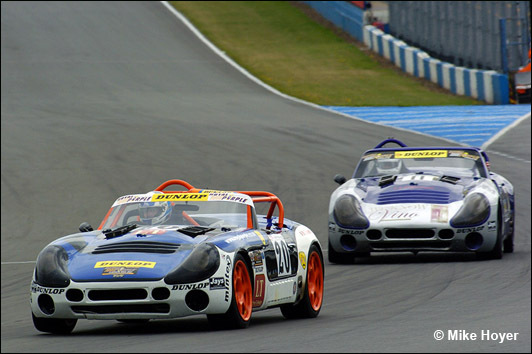 The Topcats team has been staunch supporters of EERC initiatives from the very first race meeting, and Mick Mercer, running in some new parts in the Marcos Mantis, was eighth on the grid, with team boss Warren Gilbert next, in his Sagaris, which again, had been converted from one of the team’s Tuscans. 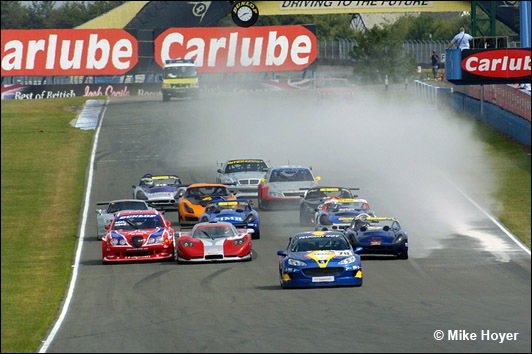 Kevin Clarke’s silhouette Mercedes V8, the Tuscans of Steve Glynn and Dean Cook, Alun Edwards’ rebuilt Marcos Mantis, and Rob Compton’s long-awaited 6.6 litre Vauxhall Belmont made up the rest of the grid, but come the race, some of the runners were missing as the cars lined up. 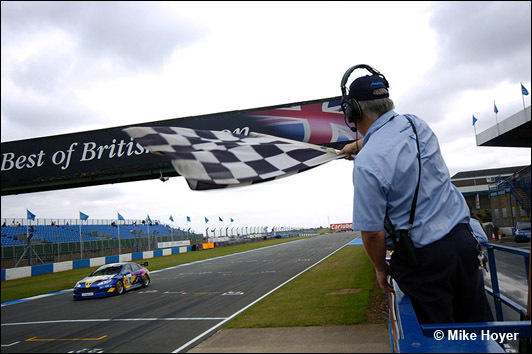 Significantly, pole-man Bennett had already decided to skip the first race; “We’ve only just finished qualifying the car for the Britcar race, and there’s no time to prepare it properly,” said Phil. 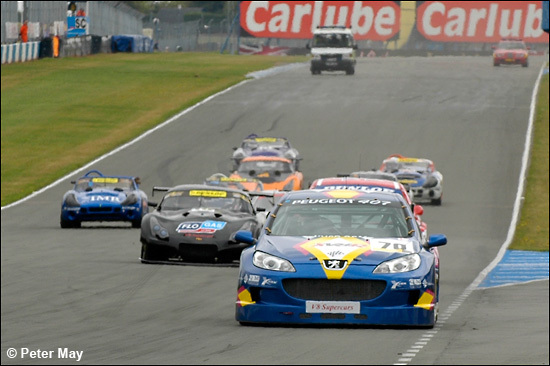 Indeed, the V8s were ready and able to take the track as the Britcar qualifiers drove back into the paddock, though the Rollcentre team stayed put in the pitlane, Kevin Riley happy to go straight into the race. At the front, this was to be a Kelvin Burt masterclass. The Peugeot went into the lead at the start, and was never headed, gradually pulling out a gap on the second-place car, which initially was Steve Wood’s Jaguar. Wood, though was coming under pressure from Tim Hood in the Sagaris, and before long, Kevin Riley joined in too, and the three cars circulated split by barely a second. This must have taken its toll on the little black Sagaris, for Hood was soon pitbound, and after attention, and a couple of exploratory laps, the car was retired. Riley continued unabated, setting the fastest race lap at 1:10.063, and on lap eight, the Mosler took the Jaguar in the chicane. Wood, ‘uncomfortable’ with a tyre, and with a comfortable cushion behind him, and saw out the race in third. 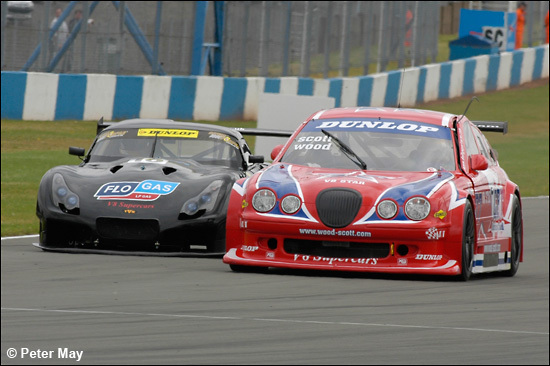 Behind him, Andy Holden was fighting off attention from Mick Mercer’s Marcos, the silver Topcats car eventually getting past, and holding of the Tuscan – just – until a brave move from Holden down the inside at Redgate on the penultimate lap sealed the outcome. 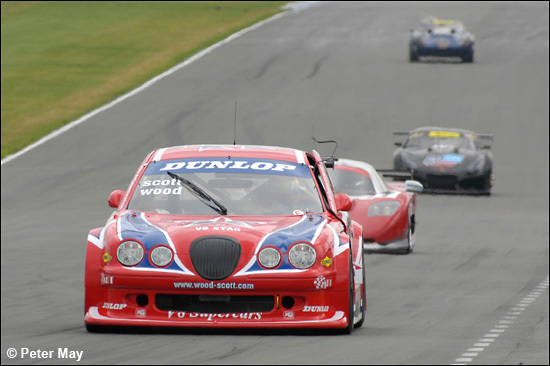 The other Topcats car in the race - Warren Gilbert’s gold Sagaris – was coming under pressure from Darren Dowling’s Tuscan, recovering after a tardy start. The battle was eventually resolved in Dowling’s favour, but Gilbert never let up, displaying his usual tail-hanging, wheel-lifting skills. Tuscan lads Dean Cook and Steve Glynn completed the finishers (below), because Alun Edwards’ Marcos retired after eight laps. 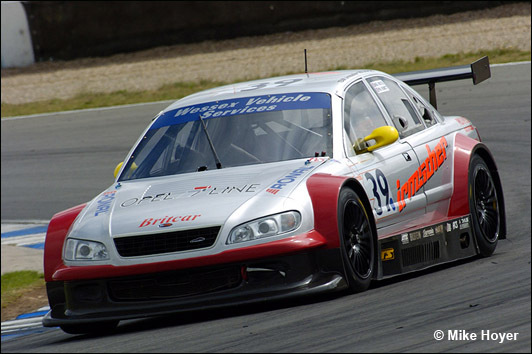 So, a debut win for Peugeot, but Riley had served notice of intent, being just over six seconds adrift at the chequered flag. The second race saw Phil Bennett, his gander up after a spoiled Production S1 race, starting from the very back, and carving through the field to get on terms with Burt, Riley, and the struggling Wood at the front. By the half-way mark, Bennett had dispensed with all except Burt’s leading Peugeot, but a swift move saw the Opel take the lead, and make it stick with a six-second margin at the end, with Riley’s Mosler in third, nearly half a minute adrift. Tim Hood was fourth, after clashing with old mucker Darren Dowling, who had to retire his Tuscan with the subsequent damage. Steve Wood struggled with tyres again, excacerbated by a “touring car lunge” from the charging Phil Bennett, leaving the Jaguar with bent steering. A broken wire in the fuel pump – a recurrence of a testing malady - saw him coast into the pit lane on the penultimate lap, and be classified as a non-finisher.